Stash It! Why are more and more women buying nail polish? As part of my new Stash It! 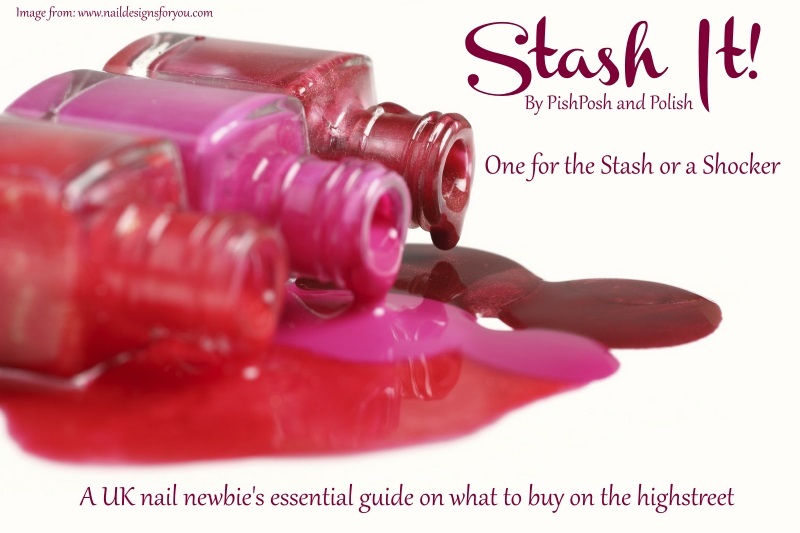 series I promised I would take a quick look at why more and more of us are now buying nail polish. This is not a conclusive list by any means and I would love to hear your reasons for starting on the slippery nail polish slope. I suppose the main reason more and more ladies are buying polish is because less and less are going to the Salon, with the economy in the state that is is, there is less money for 'frivolous' concerns, most of us are becoming more frugal at the moment, yet we still live in a materialist society. women are still expected to be be attired in the latest fashion trends. There is certainly a push towards a do-it-yourself culture, with more people cutting there own hair, making and modifying their own clothes why wouldn't it be the same for polishing your nails? So it is easy to see that one bottle of polish can cost half the price of a manicure in a salon and one bottle of polish can do infinitely more full manicures for that price. You can even easily get at home gel or gel-lookalike polishes now! Personally I have only been to a salon a handful of times for a manicure while I have countless bottles of polish so I can certainly count myself as in this category. Color is another main factor influencing consumer purchases, with more than 60 percent of nail product buyers reporting that as long as they get the color they want, they do not pay attention to the brand. This is where my Stash It! Series comes in, can a cheaper polishes really compete with named brands? (my personal answer is yes!). But in a wider context, there are far more colours on the market nowadays. Again I am generalising here but when I go to the Salon there are lots of red and pink polishes but hardly any other colours. When I go to the store I can pick exactly what colour I want! There is also such a wide range of products on the market today, at-home experimentation is ripe with 6 out of 10 women saying that want to try new nail care products. You can get so many special effects polishes in the store such as such as glitter, crackle, magnetic or whatever else that you can not get in the salon. “These days nail polish serves as both a fashion accessory and an identity statement. Celebrities like Beyonce, Zooey Deschanel and Katy Perry flaunt their flamboyant nails on the red carpet, inspiring young women to emulate their style without the expense of a designer frock. And with a myriad of different colours and effects to choose from, there’s a polish to cater to every taste." Another reason for the boom in nail polish sales is the internet, today you can find almost every nail shape, polish shade and type of nail art imaginable with only a few clicks. When I started blogging almost three years ago you couldn't buy nail art products easily, now nail art is another way to express yourself and you can buy the products everywhere, From nail art pens to flocking or 'caviar' style beads to stickers you can get it all easily (and cheaply). Nail Polish is now a Women's warpaint according to The Daily Mail. Nail Polish can play a big role in boosting confidence. I have issues with anxiety and find that wish a set of freshly painted nails I can face the world much more easily. I know lots of ladies in the nail polish community who will agree with me on this! It also appeals to our completionist natures, we want to get the full set of shades, we want this rare of discontinued colour. Something about a line of pretty bottles in a row is very satisfying. Nail polish therefore is seen as an affordable indulgence. But whatever the reasons for the New Age of Nails it has created a fabulous community of like-minded ladies (and some gents). If you are a nail newbie were any of these factors pushing you towards polishing, for the older polish-aholic do you think the new nail polish culture is a good thing with more accessibility or has it become over saturated? That link to rare discontinued colours make a me mad every time I see it, "they call themselves the lemmings" total nuggle. Loved reading this. And I really like the quote on polish being a woman's war paint. So true! Great writing!